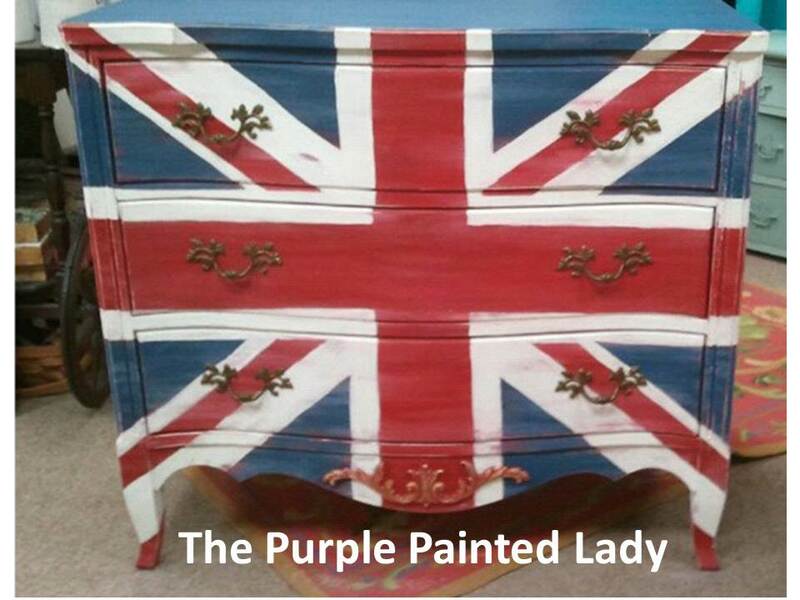 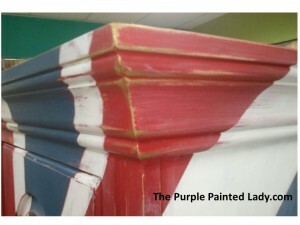 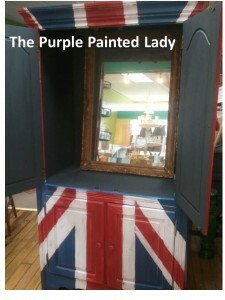 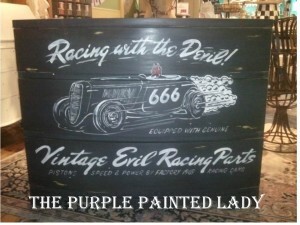 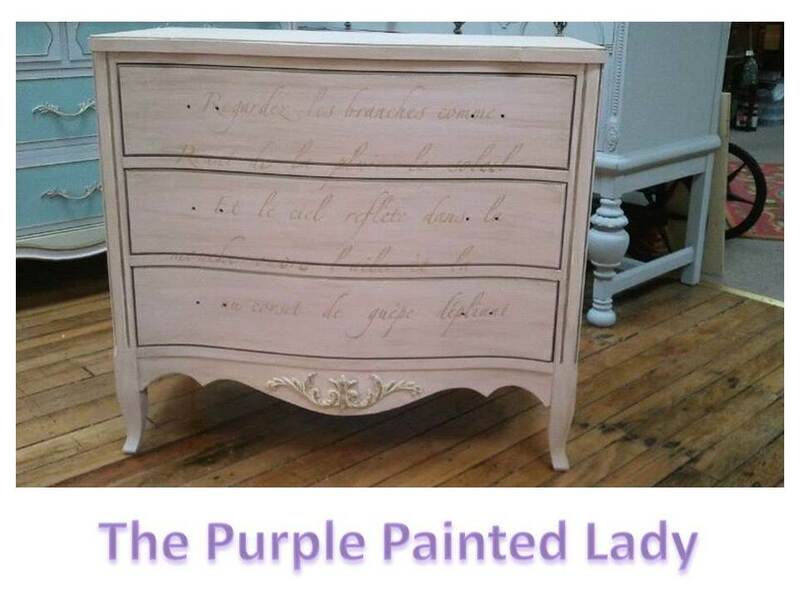 To get back to the HOME page- click up above on The Purple Painted Lady banner. Click on individual photo to enlarge! 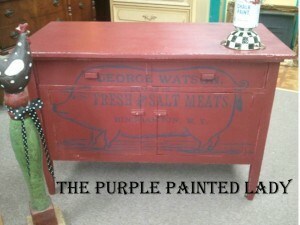 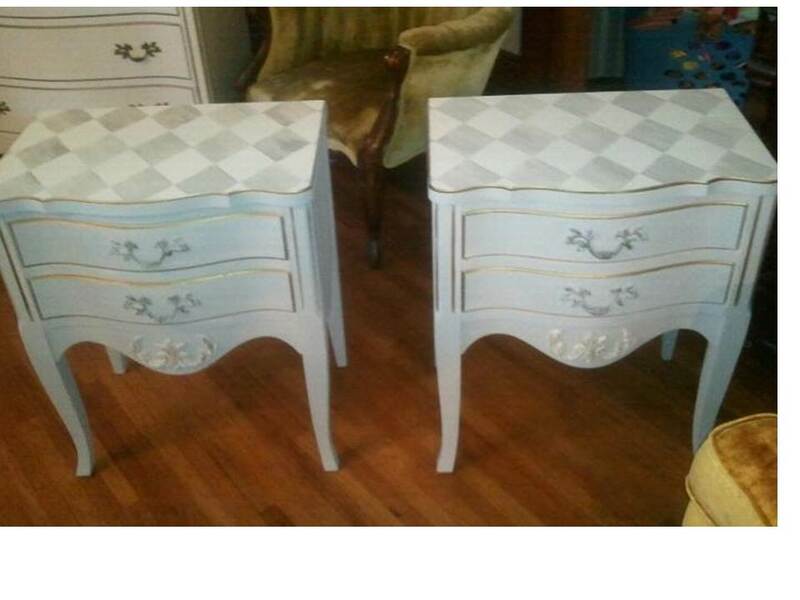 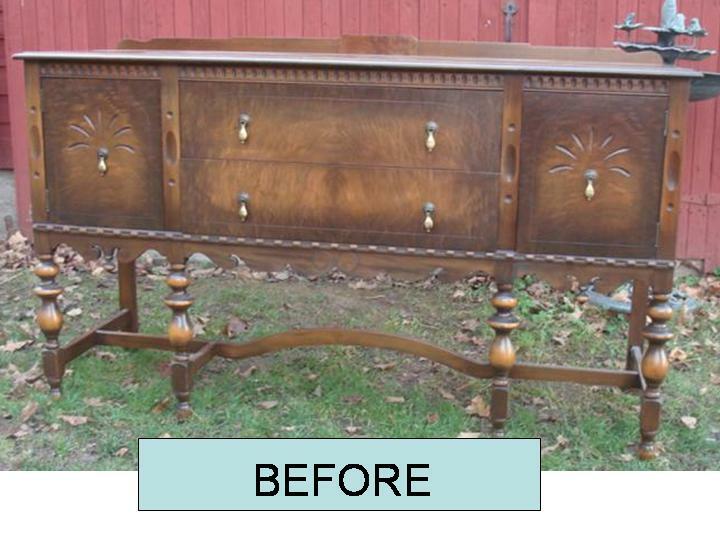 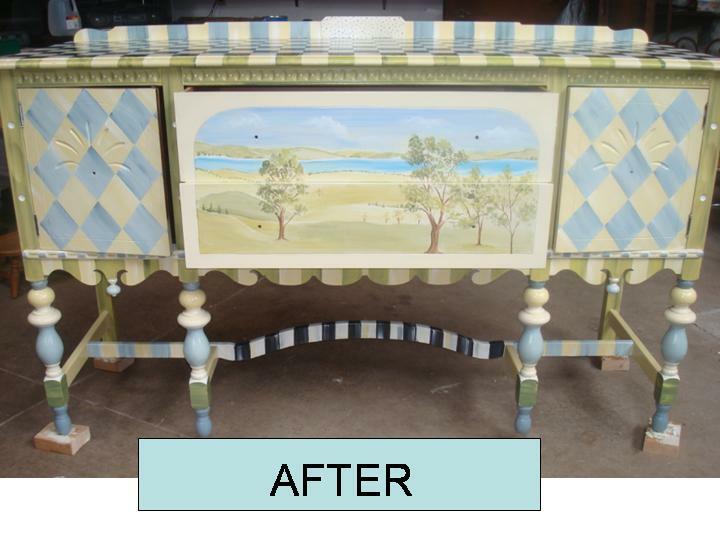 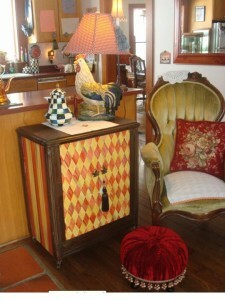 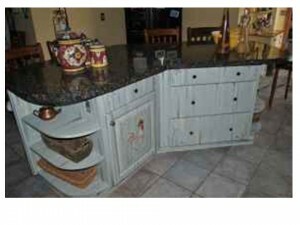 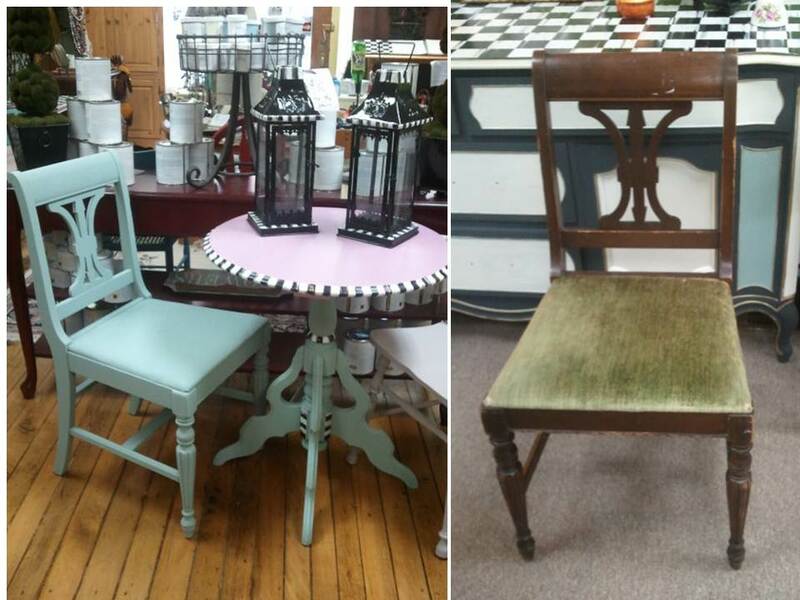 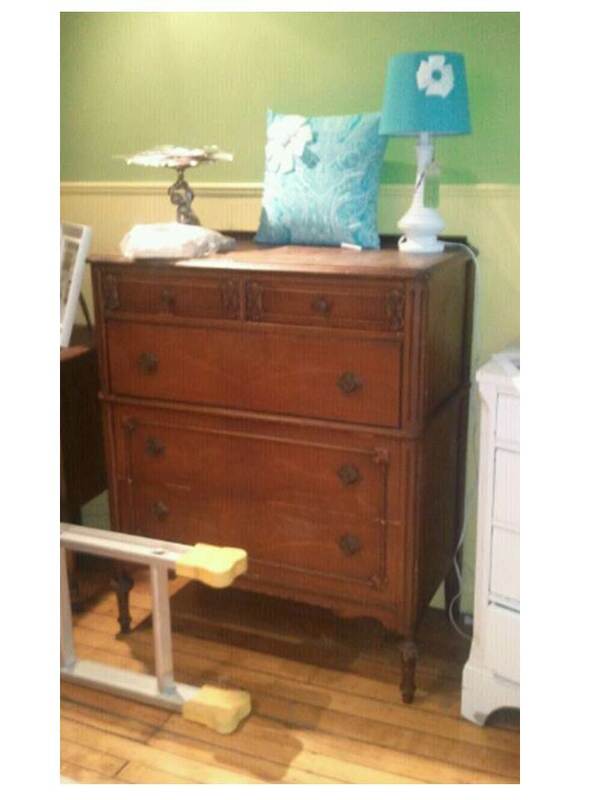 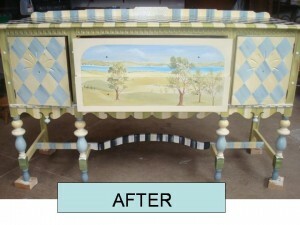 Have a piece of furniture that you would like transformed? 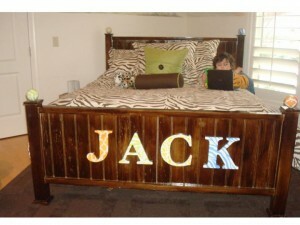 I work with your ideas and budget and provide inspiration and assistance if needed! Please contact me to discuss creative ideas that can make your home unique and personalized and give you that one of a kind- “WOW” factor! 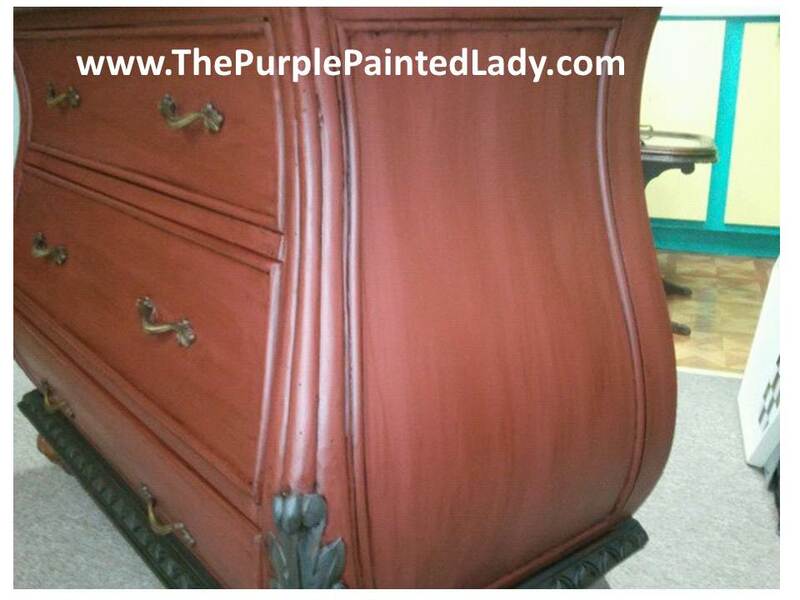 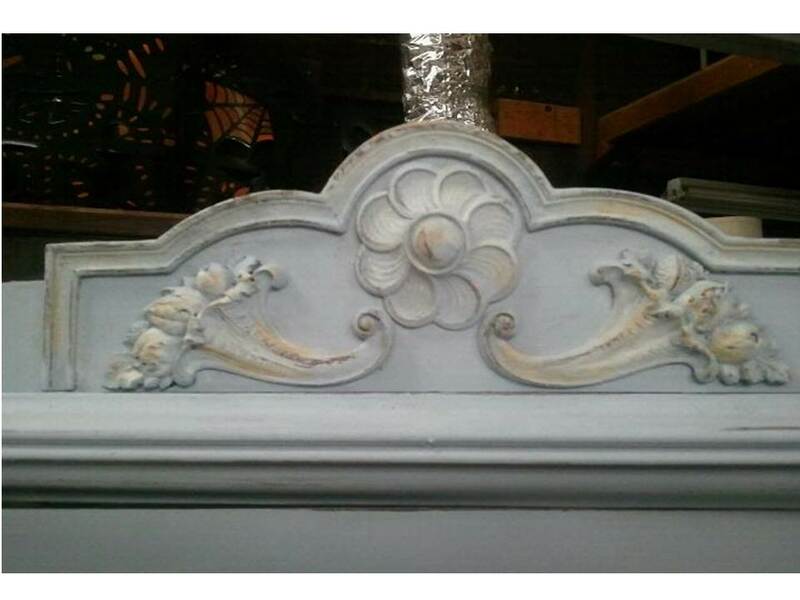 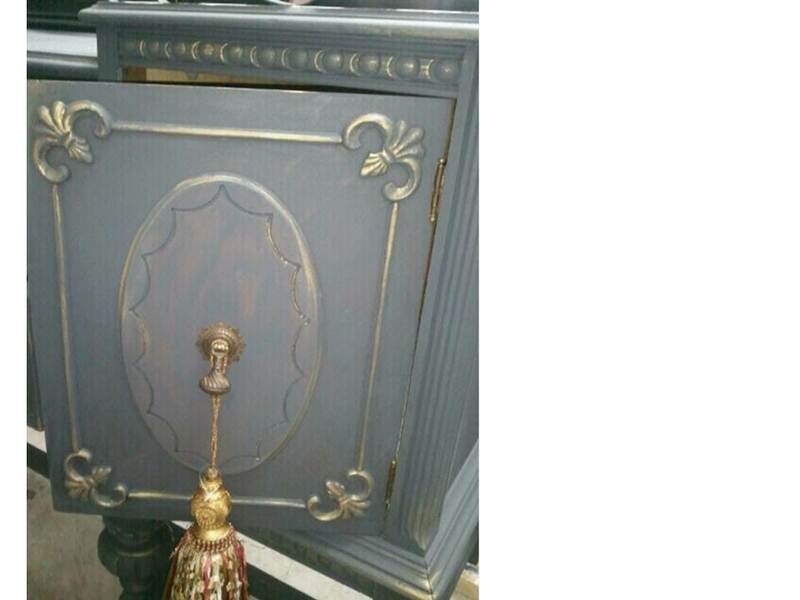 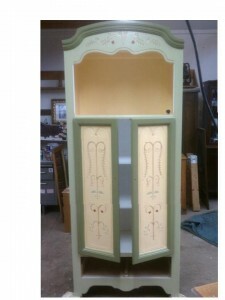 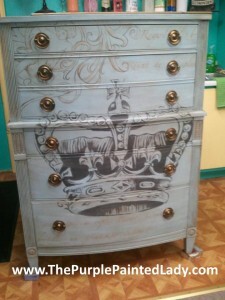 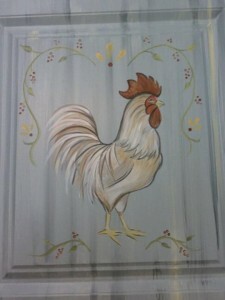 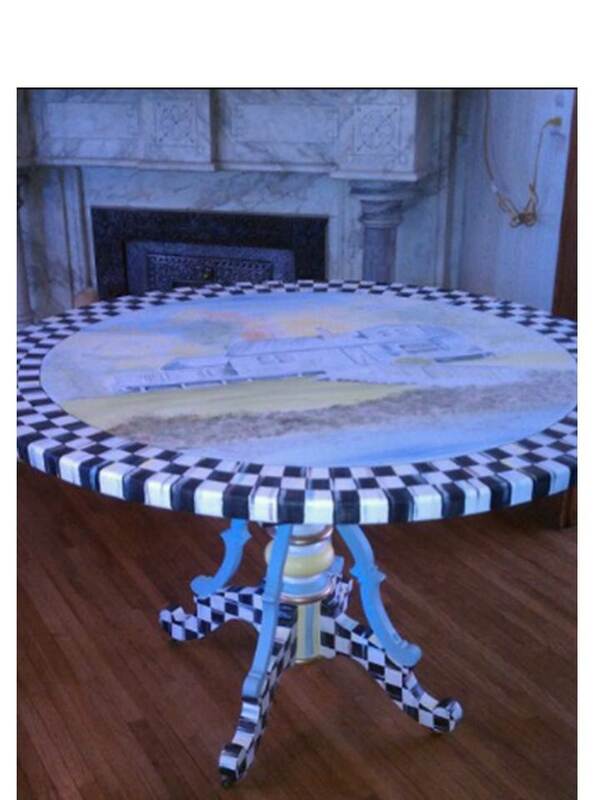 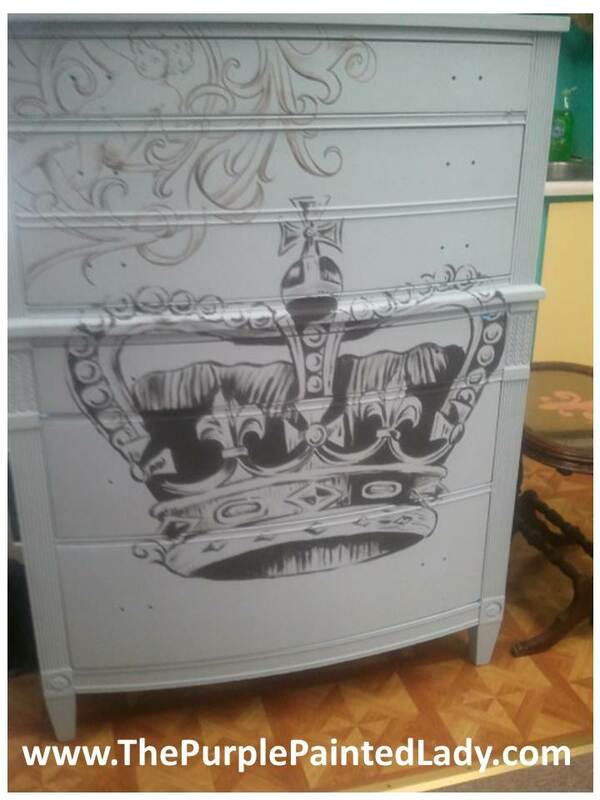 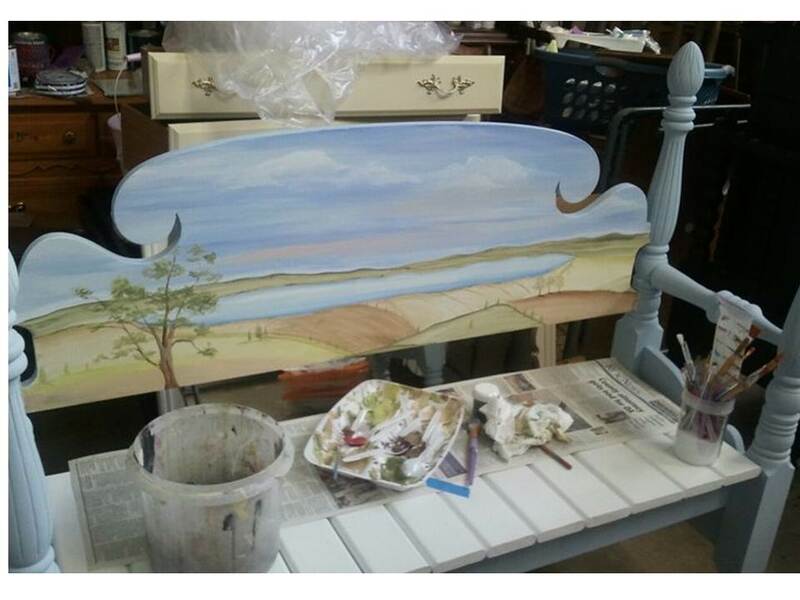 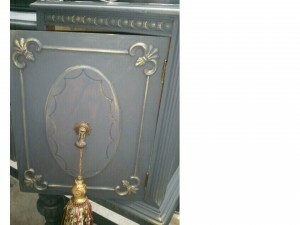 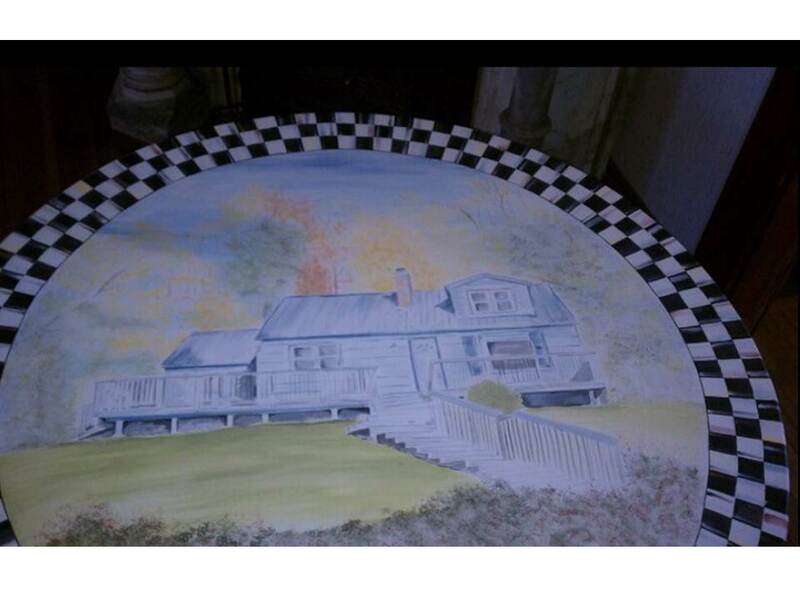 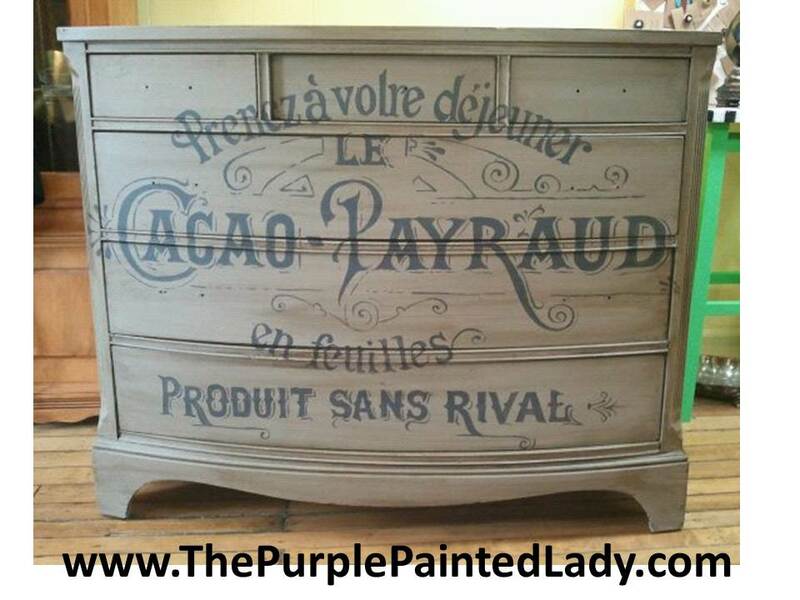 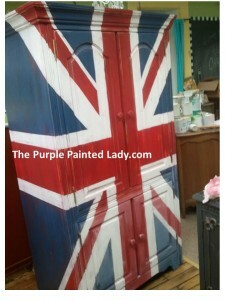 SECOND – Painted the whole piece with one coat of Annie Sloan Chalk Paint OLD WHITE. On the TOP I painted applied TWO coats. 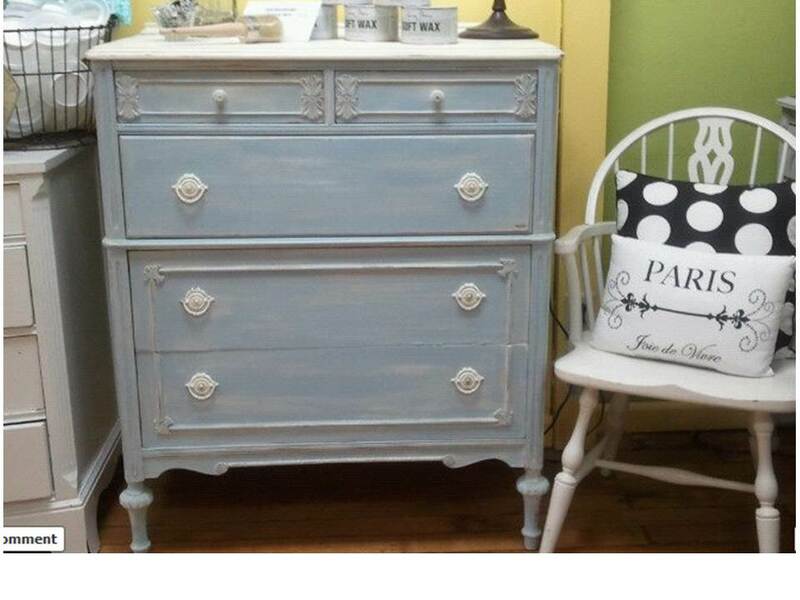 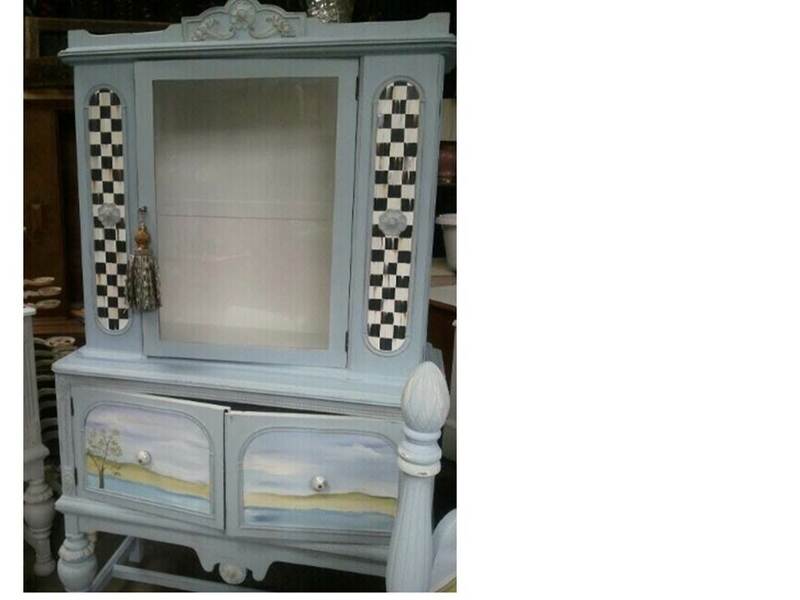 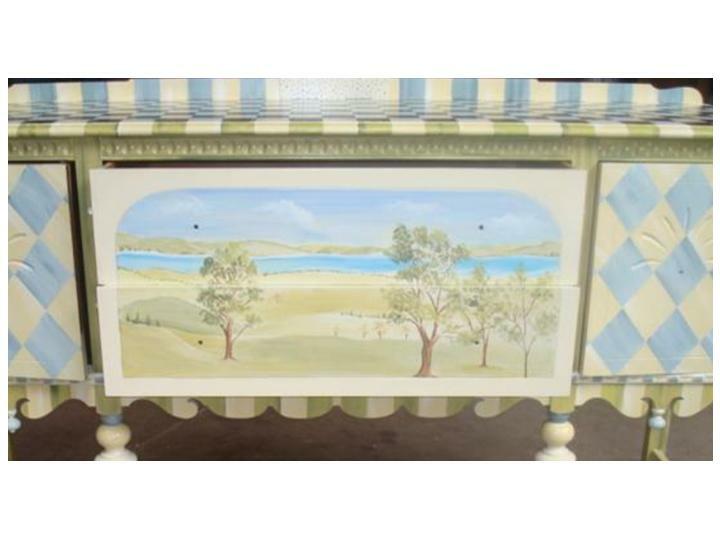 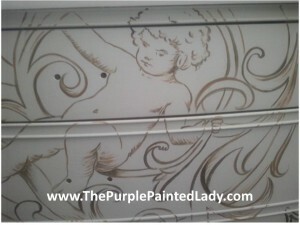 THIRD- Painted the bottom portion only of the dresser with Annie Sloan Chalk Pain LOUIS BLUE. 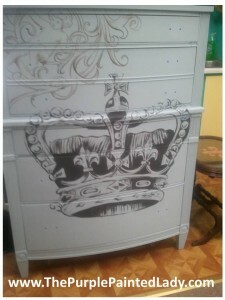 Contemplating doing this to the TOP still. Great part of Annie Sloan Products is that although I waxed it already- I CAN STILL PAINT RIGHT OVER IT without any sanding. That’s right!!!! 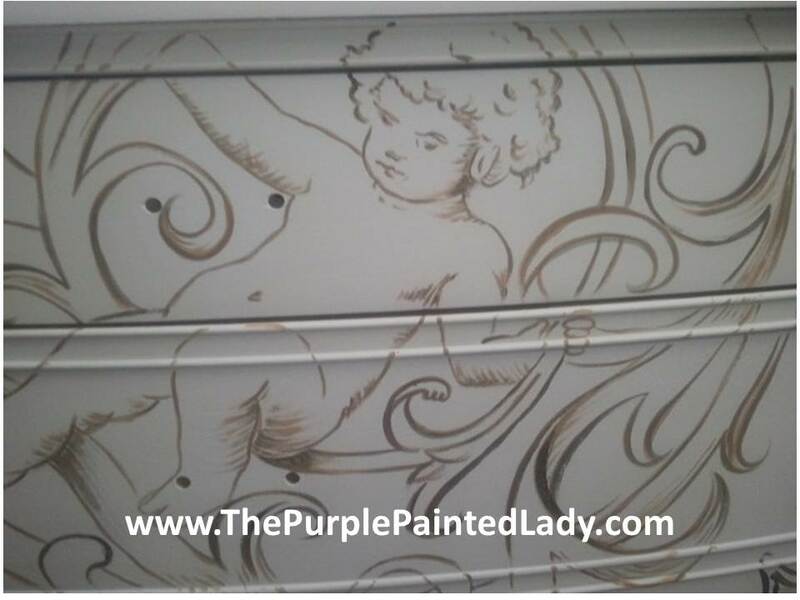 Since I was doing 2 colors- I wasn’t very focused on thoroughness since I knew I would be distressing it anyway and I like the look of a little faint wood peeking through here and there! 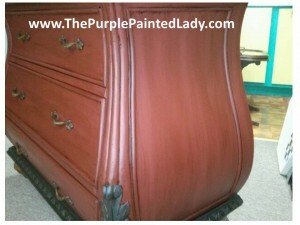 FOURTH- I applied a coat of Annie Sloan CLEAR WAX. 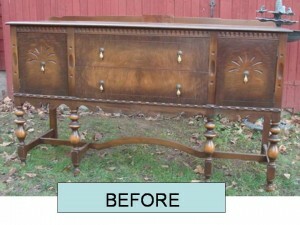 I used my Ultimate Waxing Brush. 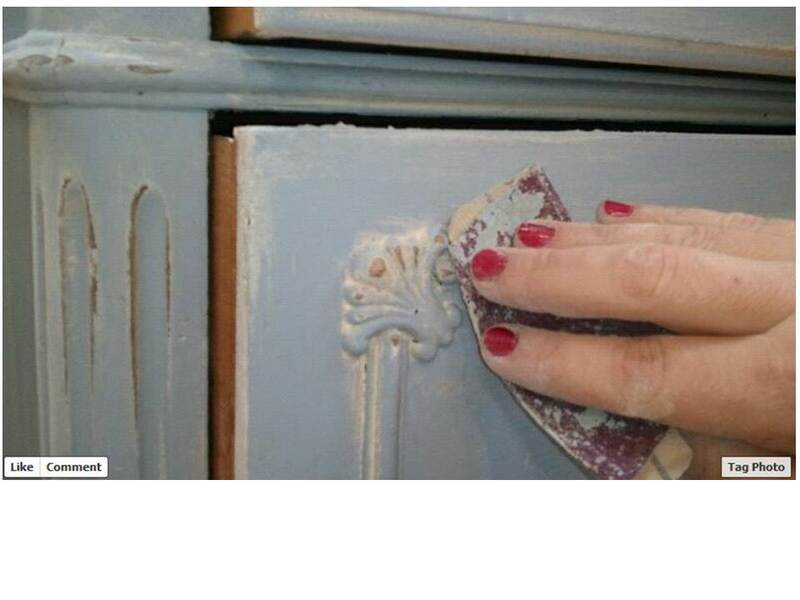 I do not believe you need this brush if only doing one piece or two…but if you plan on doing your kitchen cabinets, whole dining room, lots of furniture- THESE BRUSHES ARE WORTH THE INVESTMENT! And if you take care of them- they will last forever! 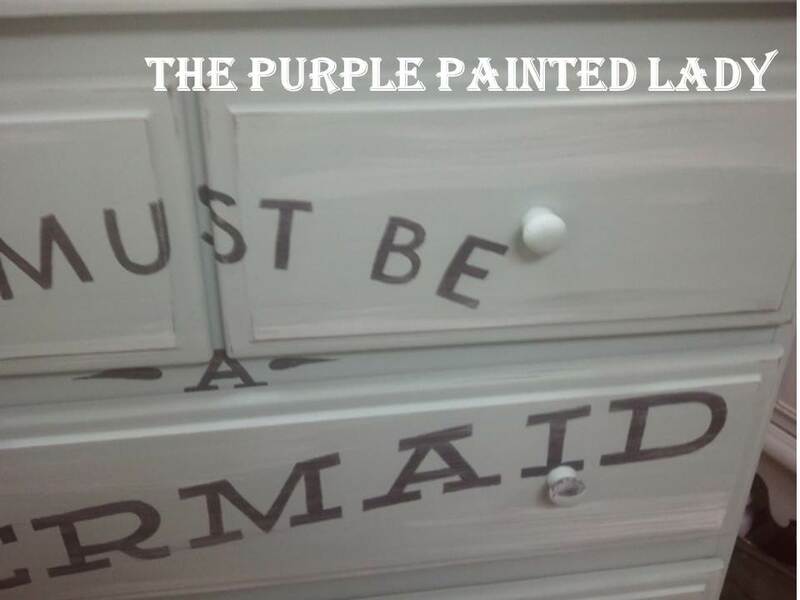 FIFTH- (my favorite part) After letting the wax FULLY dry so it is not tacky to the touch- I use a very mild grit sandpaper and had fun distressing! Oh yes I did! 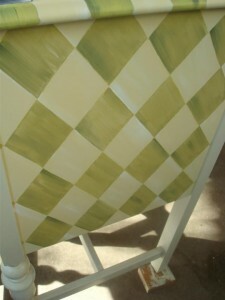 I painted my fabric chair! 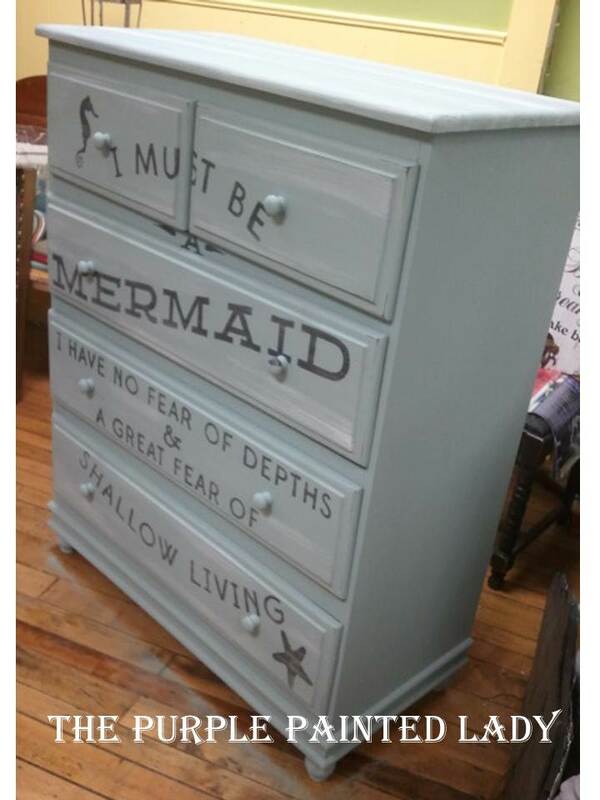 See below! This is so neat… I wish I could afford for you to do my whole kitchen! 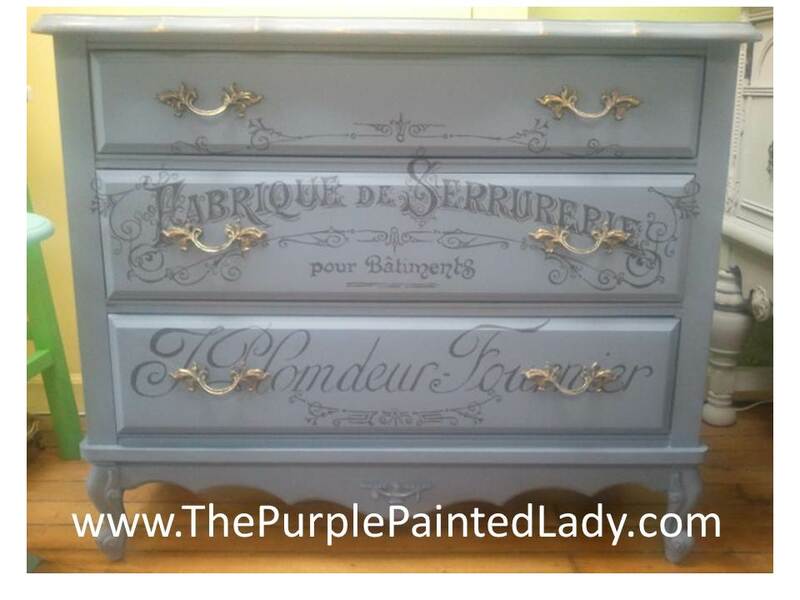 Such beautiful work! 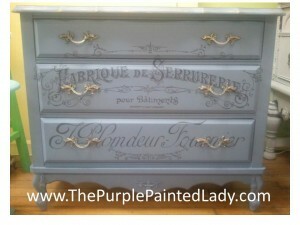 I love, love, love your work!! 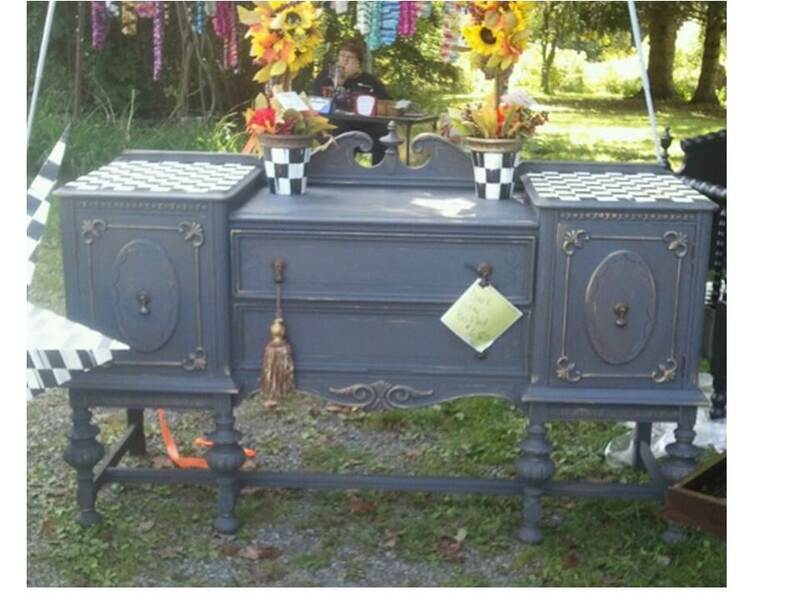 I have an old dresser that is in rough shape and would love to have you transform it into something magical. 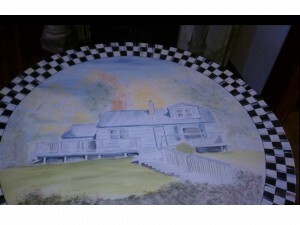 If I sent you pictures and gave you an idea of what I was interested in having done would you e able to give me a ballpark figure of what it would cost? 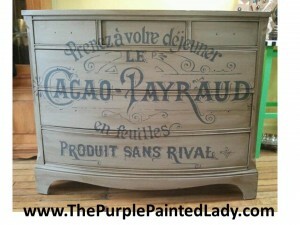 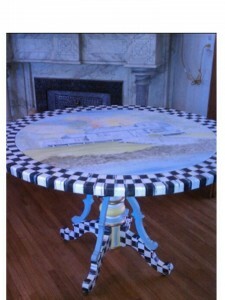 I can’t wait to get my chalk paint in the mail!! 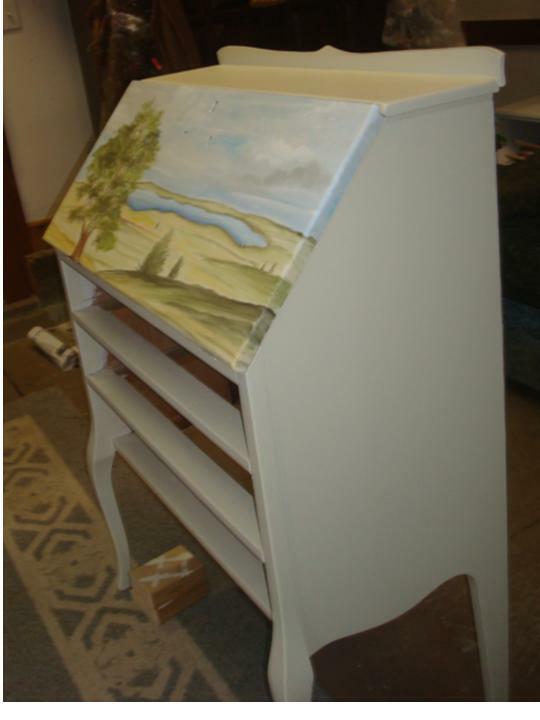 I’ve never used it before but have spent the last couple days pouring over pictures of painted furniture and reading tutorials. It’s going to save me so much time and $$!